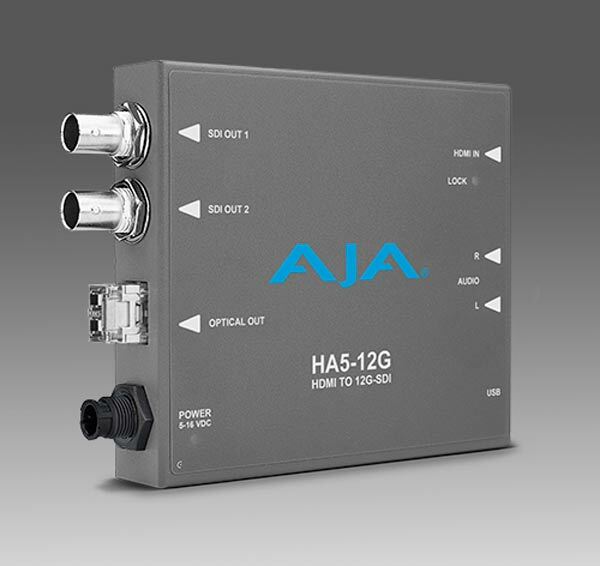 AJA’s HA5-12G and HA5-12G-T are now available. The first device allows users to convert a HDMI 2.0 input to two 12G-SDI for 4K/UHD single link outputs (up to 60p at 4:4:4/4:2:2/4:2:0). Each one of these 12G-SDI amplifier outputs with eight or two channels of embedded audio from an HDMI input or two-channel analog audio (RCA) source. It also supports EDID emulation, which guarantees the supply of the desired video formats. The second one adds a 12G Fiber transmitter (FiberLC-1T-12G SFP). This allows the device to extend HDMI 4K signals over long distances (10km in Single Mode). All the HA5-12G models includes an international power supply (DWP-U-R1), five-year warranty and an USB port for firmware updates.